With over 150 locations in 24 states, Jamba Juice is one of the top smoothie chains in the country. 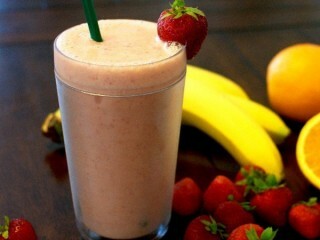 And yes, these smoothies are big, so rustle up a 24-ounce cup, or get ready to share. Here are the Jamba Juice copycat smoothie recipe clones for six of the favorites from Jamba Juice's big list of fruity smoothies: Banana Berry, Orange-A-Peel (photo), Citrus Squeeze, Cranberry Craze, Peach Pleasure, and Strawberries Wild.